FC Cincinnati plans to put its stadium in the West End, close to — and in one case on top of — businesses that have been there for years. 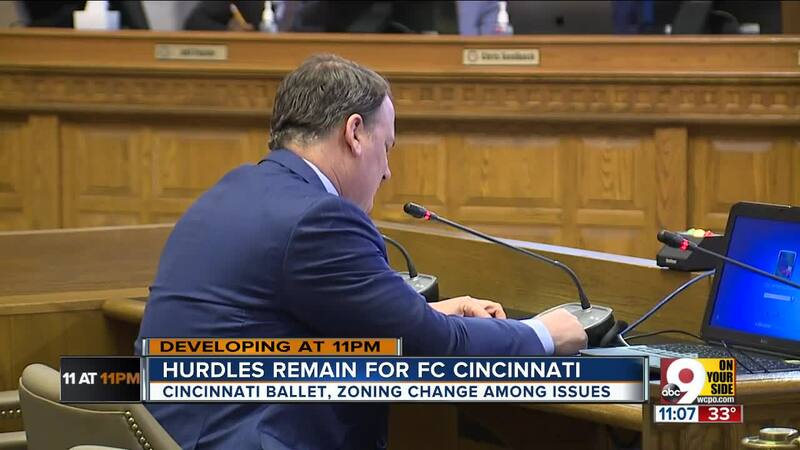 The Cincinnati Ballet, the latest group to raise a concern, kept the team and City Council on their toes Wednesday night. CINCINNATI — FC Cincinnati's stadium plans may be delayed by a pas de deux with the Cincinnati Ballet, which said in a statement Wednesday night team leaders had repeatedly neglected to address deep, long-running concerns about their planned move into the already-crowded West End neighborhood. In a statement of his own, team president Jeff Berding claimed the dance company's objections represented an abrupt pirouette from an organization that had until that point been supportive of the rapid development involved in securing and preparing the stadium site. "It is not and never has been our intention to stand in the way of the FCC's construction," ballet spokeswoman Nicole Doll wrote in the company's statement. "The stadium in the West End can only add to the vibrancy of the neighborhood and we were among the first to welcome them to the West End." What's the problem, then, that caused City Council to postpone a scheduled Wednesday vote on a necessary zoning change? Parking. The ballet company currently leases the northeast corner of the stadium site from the team and uses it as a lot for performers and staff. According to the company's statement, the team has repeatedly refused to talk to its leaders about what will happen to the lot or where ballet workers will be expected to park. "The simple fact is a $250 million stadium has been dropped immediately adjacent to the Cincinnati Ballet, with future development having been shown on the Ballet's parking lot," Doll, the ballet spokeswoman, wrote. "It should surprise no one that this has created a dynamic that requires thoughtful collaboration and negotiation." The ballet isn't the only one West End entity to resist FC Cincinnati's expansion. Also at issue Wednesday was the still-unresolved displacement of Monica Williams' Just Cookin' restaurant. Williams' business was located on the proposed site. She still does not have a new location and has expressed a desire to stay in West End but says finding a new location is cost-prohibitive. Councilman P.G. Sittenfeld called Wednesday's motion to delay the vote, saying the "generations-long" implications of the project meant the concerns were worth working out, even if it meant added cost and delays in construction. "This is a good debate to be having," Sittenfeld said. "I'd rather be a city where we're succeeding to have things sometimes collide. I think we can get in a better place." Neither City Council nor Mayor John Cranley scheduled a follow-up meeting, meaning the city could hold the zoning change required to begin construction until next Thursday, the council's next regularly scheduled meeting. The council did act, though, to allow a special session to be called 24 hours in advance if the parties in question reach agreements before then. Councilman Greg Landsman, who supported the team's bid to build its stadium in West End, said it's crunch time. "This is a matter of days. I'm encouraging everyone to dig in," he told team officials, community stakeholders and his colleagues at Wednesday's meeting. "The clock is on now. It's ticking. Let's get this resolved as quickly as we can." Berding told City Council that any delay in Wednesday's vote would mean a delay in what has become an allegro construction timeline. The team has committed to hosting its first Major League Soccer home game at the stadium in March 2021, and failing to meet that deadline could result in fines on the team from the league. He also warned that a delay in the vote would mean a delay in putting people to work developing the site. In his statement, Berding wrote, "Those (construction) contracts will be delayed, and minority- and women-owned businesses, union laborers, and local subcontractors wanting and ready to work and support their families will be delayed." For Councilman Wendell Young, resolving the lingering issues was worth taking more time. "I'm willing to come back tomorrow," he said. "I'm willing to come back at night. I'm willing to come back at whatever time they say they've got these issues resolved." Wednesday's City Council meeting agenda contained two ordinances related to the stadium. Council held the zoning change but approved a land deal that will transfer ownership of publicly owned land — specifically, a portion of Cincinnati Police Department District 1 headquarters' parking lot, the city-owned Town Center parking garage, and public rights-of-way on streets within the site footprint — to team ownership. The team has proposed a 26,000-seat stadium that will sit on Central Parkway just north and across Central Parkway, at the former location of Robert A. Taft I.T. High School's Stargel Stadium. Once City Council approves the concept plan and zoning change, the City Planning Commission will approve all final design details, including stadium design, on-site parking and traffic engineering.